Blood Tithe seems bulky and slow especially with no creatures to protect your life total. And it's not really on flavor, but Arterial Flow is a powerhouse in multiplayer. Exquisite Blood is indeed on my list for pickup at some point, but I appreciate you pointing it out. Words of Worship is a card I was unaware of, and will be picking it up to include it and give it a try. As for cards currently in my collection; Martial Coup, Phyrexian Reclamation, and Razaketh, the Foulblooded will likely find spots now. I will be looking to snag a few of the others listed I do not currently own. Glad to hear you feel that way in regards to Blood Tithe and Remorseless Punishment. They felt like underwhelming additions, even if they were (sort of) in theme. Exquisite Blood is an infinite combo with several of the cards in your deck (Sanguine Bond, Cliffhaven Vampire, ...). It's kinda expensive, but even if you don't want to pick up a copy, you should know about it so you know why if everyone tries to destroy your Sanguine Bond. You may want more token produces for your soul sisters. Martial Coup seems like a good include because you can use it to make tokens or as a board wipe. This deck could use some more ways to spend life for value. Arguel's Blood Fast Flip, Phyrexian Reclamation, Tymna the Weaver, Vona, Butcher of Magan, Chainer, Dementia Master Razaketh, the Foulblooded, and Necropotence all let you trade life for other resources and are mostly fairly budget. I would recommend including a few effects of that sort. 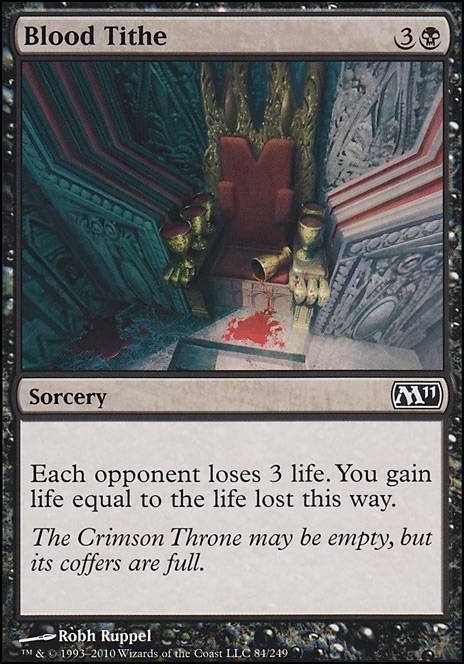 Blood Tithe and Remorseless Punishment seem low-impact in Commander: everyone starts with a lot of life so hitting everyone for 3 or one player for 10 in a non-repeatable way doesn't accomplish that much. Yeah, I would cut Dark Ritual. In EDH the upside of ramping using spells is often diminished, unless you are playing storm. Mana rocks are a much better alternative. I would cut Blood Tithe for Exsanguinate. It's basically the same card, only Exsanguinate scales better into late game. 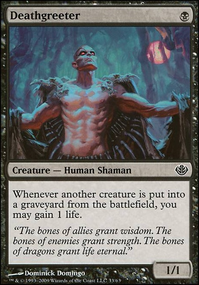 Vanquisher's Banner is a great inclusion if you are going to keep all of your one drop vampires. Heirloom Blade could be replaced by it? Feast of Blood is underwhelming to me at sorcery speed, and you already have a bunch of single target removal. I would run a board wipe in its place, Damnation or Black Sun's Zenith. Urge to Feed is cool flavorwise, but I don't think it fits, you have better single target removal and better pump elsewhere. 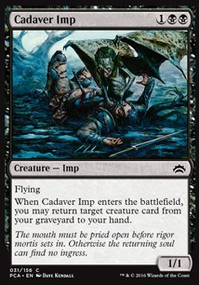 Grave Peril - Isn't a "may", and is easier to play around, gives your opponent the ability to creature they want to trigger it with. Might as well be a Chainer's Edict type spell, which I don't think you need as you are flush with single target removal. Edge of Divinity - Is good for Edgar, and is great for the cost, but he will be dying often, and there are only 2 other targets for it in the deck that get full benefit. I think there are better persistent pump options. Angel's Feather allows for an easy ETB life gain, even if it is only 1 per spell, it can help. Another artifact is Pristine Talisman which can be used for [colorless] mana and continuous life gain. One of the ultimate cards for EDH lifegain would be Venser's Journal as then you do not have to worry about overfilling your hand and can help you out if you have a slower deck. Another potential card is Suture Priest which does the same as Soul Warden but with the added benefit of damaging opponents (which can help you win). Blood Tithe can be useful in larger games along with Death Grasp and Debt to the Deathless. Since you have the potential for large sums of creatures on the field you could throw in Campaign of Vengeance which could boost you pretty well. Congregate can allow for a giant boost in life. 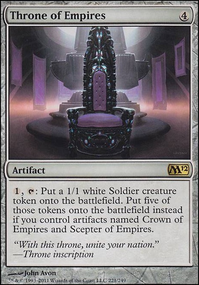 Angelic Accord can be a potential win condition type thing where you can get a constant flow of angels (until they destroy the enchantment) but this could quickly become a threat to your opponents. 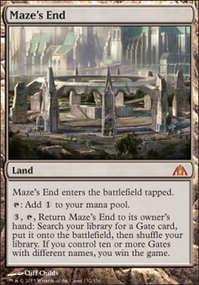 I would also suggest some mana rocks like Sol Ring and Astral Cornucopia since you have 35 land and you will want to get to roughly 7-8 mana production per turn by around turn 5-6. It might also be potentially smart to include Fumigate (or some other board wipe but fumigate fits into the lifegain) for last-ditch efforts. With you're description I'm not sure you fully understand how Baron Von Count works. He doesn't care what their converted mana cost is. All he cares about are the numerals printed on the card. For example Nirkana Cutthroat has 1,2,3,4,5 printed somewhere on the card. So no matter where the counter is on the Baron it would go down one. Shriekmaw only has 1,2,3,4 printed on it. 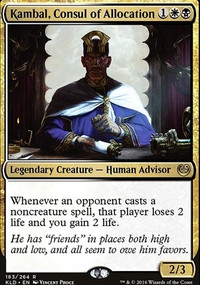 Also be careful as the Planeswalker starting count does NOT count as it is not within what Baron looks at. 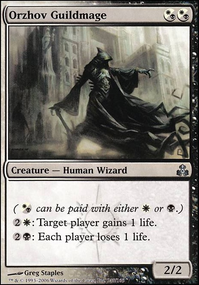 For example Sorin Markov only has 1,2,3 printed on it, and the 4 does not count (yes the numeral 1 counts from the printed "life total becomes 10"). You have a lot of Un-cards that don't really help Baron. If you're just looking to play the cards then they are fine to keep in. You also have a few ok cards in the deck that also only provide a few numbers for the Baron. TheWallinator74, the reason i've removed my Blood Tyrant from the box was exactly what you typed. He was growing too much on each game that i had him on the field and it started to get boring to my opponents. I'll take a look at Pulse Tracker and Infectious Horror. I'll take a look on the "sweepers" as well but i'll replace Exsanguinate for Blood Tithe. I would love to put the God-Pharaoh in place of the Deciever but he's really expensive in my country at the moment so for now the Deciever shall be the walker card of this deck. Lastly, this deck didn't have any mana problems in the matches i've played so i see no need to put other lands on it for now. Thanks a lot for the suggestions.